Johannesburg - Business Leadership South Africa, the biggest business lobby group in the country, has become increasingly vocal about rising levels of corruption and mismanagement of public assets. Concerns have been growing in the country that corrupt practices, particularly the looting of state assets, has become embedded in the way business is done. 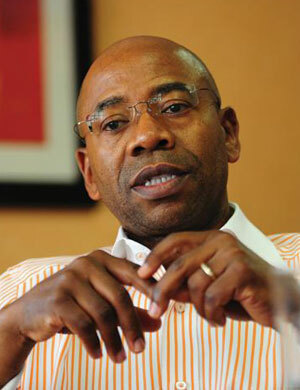 As the organisation – which represents large businesses and multinationals in South Africa – takes on a new political posture, Steven Friedman put questions to its CEO Bonang Mohale. How representative is Business Leadership South Africa of the country’s private sector? The organisation represents around 75% of the largest businesses in South Africa. Clearly their interests are not identical to those of smaller businesses. Big business, for example, is able to adapt to onerous government edicts which drive up the cost of business much easier. But what we have in common is much greater than what separates us – namely the desire to have growth-fostering economic policies under the rule of law. Right now business confidence in South Africa is at a 30-year low due to factors beyond our control but also due to actions that we can control, such as government bringing more policy certainty in areas such as mining for example– this is disastrous for large and small business alike. BLSA has committed its members to changing practices which might impede economic growth and inclusion. Are your members buying the change agenda? How do you plan to ensure that they endorse it? Yes they are. Business Leadership South Africa has taken a much more active role over the last year in terms of getting the voice of business better heard, shaping government policy and speaking out against corruption. We have requested significant resources to achieve this and our members have backed us. They understand the critical importance of the issues we are dealing with – achieving a policy backdrop that will allow us to grow the economy, create jobs and deliver transformation. In terms of endorsement, we have set out our vision in a Contract with South Africa, and our integrity pledge, which establishes our business values. We expect our members to honour these. If they are in breach, they cannot be members. We showcased our commitment to the contract and the pledge through the suspension of three major corporations KPMG, Eskom and Transnet. You’ve suspended Eskom and Transnet due to what you say is behaviour at odds with the organisation’s values. What do you mean by this? The integrity pledge makes clear that we have a zero-tolerance policy on corruption. There is a lot of prima facie evidence that both of these organisations have been involved in corrupt conduct. They were not able to satisfy us that they recognised the seriousness of the charges and were determined to address them. So the suspension of their membership was appropriate. There is a view that Business Leadership South Africa is tougher on public sector corruption and lenient where the private sector is concerned. What’s your view? This is not true. Where there have been instances of bad behaviour in the private sector, accountability has followed. For example, construction industry executives involved in rigging bids around the World Cup are no longer in office. More recently there’s been the case of KPMG. The executives responsible for the decisions that landed the firm in trouble have left. And it’s been suspended from BLSA. By contrast, in government and state owned enterprises there is no accountability. Executives behave with impunity. And while corruption is wrong wherever it occurs, we must resist the spurious symmetry of discussing public and private sector corruption as though South Africa is facing a problem of equal gravity in both. Unfortunately, we now have a government that is corrupt from top to bottom. By contrast we have a private sector that is overwhelmingly law abiding. That is a very significant difference. How far are you prepared to take your anti-corruption mission? Some of your members have been found guilty of abusing vulnerable consumers. Will you act against them? Business Leadership South Africa will act against any member whose behaviour is against its own values and damages the reputation of business. These values are encapsulated in the organisation’s integrity pledge and the contract with South Africa. Taken together, these outline a zero tolerance attitude to corruption, a belief that business should behave with courage, integrity and consistency, and a strong belief that business can be a force for good. Sometimes business will make mistakes and that can be accepted provided the organisation takes suitable action to address the problem. Do you accept that business itself needs to change its ways of doing business if it’s going to win public confidence in its mission against corruption? Yes, we do. There is clearly a large “trust gap” between parts of the public and business. Some of this is down to ignorance. Some of it can be explained by the deliberate misinformation as seen in the toxic White Monopoly Capital campaign. As we now know this was a highly racialist narrative that sought to blame everything that’s gone wrong in South Africa on an imaginary lily white private sector. We believe this particular line of attack is being used to detract attention away from the real issue - which is increasing corruption. And some of the mistrust is rooted in history, with business still regarded by many as having collaborated with the apartheid system and furthering its legacies. But some of it is also attributable to business’s own behaviour including collusive conduct in certain industries and inflated executive compensation. But business is a national asset, not the problem. So it is in everybody’s interest that the South African public improves its understanding of business, and its overall reputation. Business needs to explain and demonstrate that it is part of society and does not stand apart. That it shares the same vision and goals, notably of combating the scourges of unemployment, inequality and poverty. Business also needs to help society understand that the major problems the country is facing don’t just lie at its doorstep. Certainly, there are things business can do better, but the much larger problem is the havoc being wreaked by state capture and poor policy development and execution. This is part of a series called Face-to-face that The Conversation Africa is running in which leading academics interview prominent individuals in the public, private and not for profit sectors. Steven Friedman is a professor of political studies at the University of Johannesburg.